One of are accounts called us out to pull a trailer that was sinking in the mud! The trailer legs were about 1 ft sunk in the ground. The trailer had some extra weight in it that made it heavy. 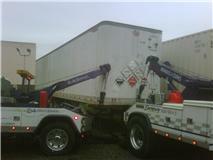 Here we have our ford 550 and 750 lifting the trailer while they were able to put support underneath the legs.